You’ve made it to the home stretch. After months of balancing assignments, projects and midterms, this is your final chance to secure the grade you’ve been aiming for. 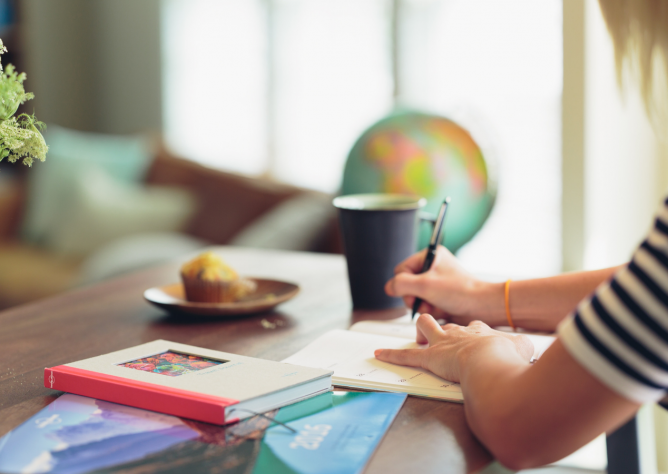 While it can be easy to get overwhelmed and lose motivation so close to the end, these simple tips will keep you on track and make the most of your study time. Keep yourself from getting overwhelmed by setting a schedule for the classes you’ll cover each day and for how long. Then, divide the material into bite-sized pieces so you can master each section before you move on to the next. Put your phone on airplane mode or leave it in your backpack while studying. It’s too easy to get distracted when a Snapchat comes through and suddenly you’re 30 minutes deep into a social media rabbit hole. Draw pictures, use white boards, create color-coded systems, sketch thought maps and diagrams. The more you look at a concept from different angles, the better you’ll understand and remember it. Spray an unfamiliar scent or chew a unique flavor of gum while you’re studying. Then use the same flavor or scent during your exam to jog your memory. Although you won’t use it during the exam, creating a cheat sheet as if you’d be able to take it with you will help you sift through your material and identify the most important concepts. It also becomes a quick reference you can use when studying. Leverage your spare time by flipping through flash cards on the bus, recording definitions or chapters you can listen to in the car, or using online apps to create practice quizzes you can take between classes. Technology is great, but physically writing connects better with the brain. Write out the concepts and definitions you struggle with until they stick. Your mind will make connections between the material you’re studying and the environment around you. If you always study in the same spot, you’ll perform best there, but if you seek out new places like a cute coffee shop or cozy nook in a new building, you’ll be able to adapt more easily to your testing space on exam day. Avoid getting burned out and run down by setting small, achievable goals and reward yourself as you accomplish them. Stay fueled with healthy study snacks like microwave potato chips or flavored popcorn and build time into your schedule for exercise and relaxation to keep your brain fresh. If you can’t seem to lock down a certain concept, don’t get too hung up on it. Remember, there will be many other topics on the test. If you spend too much time on something you may never fully grasp, it could cost you the opportunity to nail down 10 other ideas more successfully. While you’re studying this semester’s material, Ohio farmers are studying too. They’re analyzing data and seed performance from this year’s growing season as they make plans for planting in the spring. While they may not have to fill out Scantron sheets or write any essays, they are put to the test when their next crop hits the ground. Finals are stressful, but they’re nothing you can’t handle. Trust yourself, push through and finish strong!